When the Parthenon was built between 447 BC and 432 BC, three sets of sculptures, the metopes, the frieze and the pediments, were created to adorn it. 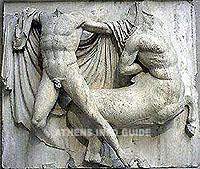 Of these, the metopes and the frieze were part of the structure of the Parthenon itself. They were not carved first and then put in place, high up on the Parthenon, but were carved on the sides of the Parthenon itself after it had been constructed. The metopes were individual sculptures in high relief. There were 92 metopes, 32 on each side and 14 at each end and each metoop was separated from its neighbors by a simple architectural decoration called a triglyph, The metopes were placed around the building, above the outside row of columns and showed various mythical battles. The north side showed scenes from the Trojan war; the south side showed a battle between the Greeks and the Centaurs -- part man, part horse; the east side showed the Olympian gods fighting giants and the west side showed a battle between Greeks and Amazons. The frieze, 160 meters (525ft) long, was placed above the inner row of columns, so it was not so prominently displayed. It is one long, continuous sculpture in low relief, showing the procession to the temple at the Panathenaic festival. At either end of the temple, in the large triangular space, the pediment statues in the round were placed. These were designed to fill the space so that those at the highest point of the triangle are enormous. The pediment sculptures have been so badly damaged that we only know what they represent because of the writings of the Greek writer and traveler Pausanias, who was active around 150 AD. According to him, the sculptures in the east pediment represent the birth of Athena from the head of Zeus and the sculptures in the west pediment represent the struggle between Athena and Poseidon for the land of Attica. Thomas Bruce became the seventh Earl of Elgin in 1771 at the age of five. Lord Elgin married in 1795 and promised his wealthy young bride a fabulous new mansion as a wedding gift. At that time, "all Greek things" had become the rage in Great Britain. Elgin's appreciation of Greek art and architecture, combined with his desire to be the envy of British nobility, prompted him to employ Thomas Harrison, an architect who had studied Greek and Roman styles, to design his new home, Broom Hall, in the classical style of Greece. Elgin's goal was further empowered in 1799 when he was appointed British ambassador to the Ottoman Empire and assigned to the capital in Constantinople, Turkey. The Turks had previously conquered Greece and occupied and controlled the country, including, of course, Athens. Although removal of sculptures from the Parthenon was not Elgin's original intent, his position as British ambassador practically invited him to request permission of the Turks to take away works of Greek antiquity to adorn his planned Broom Hall. As the Turks had little regard for Greek art, which they certainly possessed as conquerors of Greece, they fairly readily granted the request. The favor of the powerful ambassador was of far greater value to the Turks than were the ancient Greek statues in Athens! The firman (or authority) the Turks gave Elgin in 1801 included the word "qualche," which could be translated either "some" or "any." While the original intent of the Turks' meaning will never be known for certain, Elgin's agents in Athens interpreted "qualche" as "any". Lord Elgin put together a team of painters, architects and molders. The following year, the local Turkish commandant allowed the artists to make drawings but refused to allow them to take casts or build scaffolding for a closer look at the sculptures. In 1801 Elgin obtained a firman, or authority, from the Sultan which gave him permission to take away any sculptures or inscriptions which did not interfere with the works or walls of the citadel. The looting of the Parthenon began immediately. The sculptures were lowered from the temple and transported by British sailors on a gun carriage. On 26 December 1801, fearing the French might try to obstruct his work, Elgin ordered the immediate shipment of the sculptures on the ship "Mentor" which he had brought for this purpose. During 1806, one of the Caryatids was removed, as well as a corner column of the Erechtheion, part of the pediments and the friezes of the Parthenon, many inscriptions and hundreds of vases. Others joined in the looting and this incredible activity, which was not confined to the Acropolis but was carried out throughout Athens and large parts of Greece, continued for many years. In 1810 Elgin loaded the last of his booty on the warship "Hydra". In 1817 two more warships, the "Tagus" and the "Satellite", were loaded with gravestones, copperware and hundreds of vases. Four years later, the Greek War of Independence finally brought Elgin's looting to an end. Find out where in the world other parts of the Parthenon marbles are kept. It was January 1804 when the first 65 cases arrived in London, where they remained for two years because Elgin had been imprisoned in France. The maltreatment which the Marbles suffered was unavoidable. They were placed in the dirty and damp shed at grounds of Elgin's Park Lane house and remained there for years, decaying in London's damp climate, while he tried to find a buyer. Elgin made attempts to sell the Marbles to the British government but the price he asked was so high that they refused to buy them. As the years passed, so the Marbles influenced the lives of people in Britain. Churches, buildings and houses were built in Greek classical style. In a letter written by Elgin in 1815, he admitted that the Marbles were still in the coal shed at Burlington House, decaying from the destructive dampness. Finally, in 1816, the Marbles were sold to the British government and were at once transferred from Burlington House to the British Museum, where a special gallery was eventually built for them by Sir Joseph Duveen at his own expense. Note: recently it has become clear that there are still a lot of Greek works of art at Burlington House to this day. In December 1940 a Labor MP, Mrs Keir, asked the Prime Minister, Winston Churchill whether the Marbles would be returned to Greece in partial recognition of that country's valiant resistance to the Germans and the sacrifices of its people. The answer was negative. At the time that Mrs Keir tabled her question, there was a large number of letters published in the Times favoring the return of the Marbles to Greece. In 1941 the head of the Labor Party, Clement Attlee, who was a member of the wartime coalition government, replied to Mrs Keir's question, saying that there was no intention to take any legal steps for the return of the Marbles. Cleaning of the Parthenon marbles was undertaken over a period of fifteen months from 1938 to 1939, when museum workers without official authorization used copper tools to remove what they believed was dirt but was in reality the honey-colored patina of the historical surface. An official statement released at the time and published in The Times, stated that the commissioning of Lord Duveen's new gallery to house the sculptures presented a good opportunity to clean the sculptures and improve the surface appearance by removing spots of discoloration. The British Museum Standing Committee found that "through unauthorized and improper efforts to improve the color of the Parthenon sculpture for Lord Duveen's new gallery, some important pieces had been greatly damaged" . This resulted in disciplinary action being taken against two officials. There was further controversy over the cleaning of the marbles in 1983, when the British Museum was accused of speeding up the process of decay by coating the caryatid with a supposedly protective plastic film. For many years, the Elgin Marbles have inspired a controversy about which few informed individuals of any nationality can remain indifferent. Lord Elgin, a British diplomat from Scotland, has been oft maligned by those who fervently believe he all but stole ancient marble sculptures of inestimable value from the Parthenon on the Acropolis in Athens, Greece. Others believe just as strongly that removing the works from Athens and shipping them to London (they are displayed in the famed British Museum) saved them from almost certain destruction. Both camps have valid points. For centuries, the British have had high values and morals. These are shown not only in the present Great Britain but also are proven by its own great history and its valuable traditions. However, there is a stain on the Union Jack. Without wanting to go into controversy, the so-called Elgin marbles, actually the Parthenon marbles, have to be returned to Athens. They are a part of the Parthenon and they belong together. On top, they are part of the rich history of Greece that belongs to the Greeks, not the British. What would the position of the British government be if half of the crown jewels, kept in the Tower of London, would be taken by Greece and put on display in a museum in Athens and the Greek government would refuse to give them back? After almost 180 years, it is time to do the right thing. It is time to give the Greeks what is rightfully and historically theirs. It is time to return the Parthenon marbles to Athens. With every day that passes, the stain on the Union Jack is getting bigger as is world support for the return of the Parthenon marbles. There is no honor, nor respect, to be gained in being stubborn for the wrong reasons. A palm-sized marble fragment detached from the Parthenon was handed over to Greece on 4 September 2006 by the Heidelberg University's Museum of Antiquities. The small piece, measuring 8 by 12 centimeters, is the first section from the 2.500-year-old monument to return to its place of origin after an absence of almost 150 years. The highly symbolic gesture has raised the Greek government's hopes over the long - and for decades fruitless - campaign for the repatriation of the Parthenon Marbles displayed at the British Museum in London. Though the best known example of a foreign institution holding on to Parthenon antiquities is that of the British Museum. The so-called Elgin Marbles were removed by Lord Elgin in the early 19th century. Fragments from the 5th century BC temple, dedicated to goddess of wisdom Athena and regarded as the peak of ancient Greek architecture, are kept in the Louvre, the Vatican as well as smaller museums in Palermo, Vienna, Copenhagen, Munich and Wurzburg. The Heidelberg fragment belongs to block VIII in the lower right corner of the Parthenon frieze's north section. It depicts the foot of a chiton-clad leaf-bearer (thalloforos) in relief, who along with two guitar-playing figures in long robes and sandals, joins the religious Panathenaic procession that is represented on the 160-metre strip of marble slabs. Most likely, the sculpture ended up in Heidelberg's collection through a traveller who took the fragment back to Germany around 1871 as a souvenir. In 1948 it was identified as part of the Parthenon by archaeologist Herman Hafner.